‘Newington’ at the ‘Hayling Billy’ pub at Mengham on Hayling Island. Following ownership by its builders the LB&SCR, transfer to the neighbouring London & South Western Railway, resale to the Isle of Wight’s Freshwater, Yarmouth & Newport Railway, service with the Southern Railway, and nationalisation as part of British Railways. No:46 ‘Newington’ continued its wanderings well into preservation era, going first to Droxford as part of a sadly unsuccessful scheme to save part of the Fareham to Alton ‘Meon Valley’ line. Until purchased in 1966 by the renowned Hampshire brewery Brickwoods, for restoration to ‘Stroudley-esque’ livery for static display outside their new ‘Hayling Billy’ pub, in Hayling’s Mengham village. Her return to Hayling lasted until 1979 when the locomotive once more migrated to another former Island home, after the locomotive was kindly donated by Brickwoods to the Isle of Wight Steam Railway. Where it can be seen to this day, restored to full working order including a completely new boiler, operating passenger trains between Smallbrook Junction and Wootton via Havenstreet. 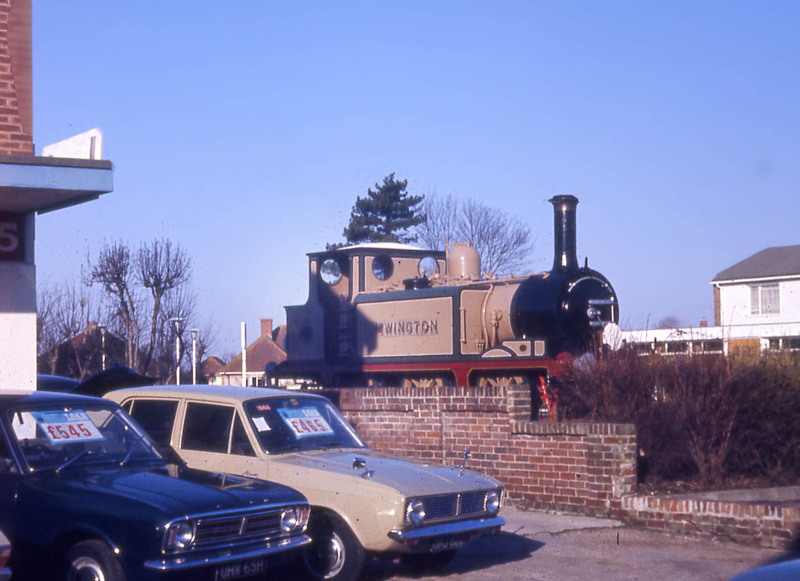 The now ‘classic’ cars shown in this early 1970’s picture of ‘Newington’ on her pub-side plinth, would doubtless now fetch rather more than the rather attractive prices shown on their windscreens! (Photo by Ian Edwards). Next: 46 ‘Newington’ as Southern Railway W8 ‘Freshwater’ on the Isle of Wight Steam Railway.